Wow, I’m still shaking. I just got back from a midnight screening of “The Volorcist,” that indie movie from “Magician’s Hat” production company. They’re the same group that brought us “Little Shop of Volunteer Horrors” a few years back. Yep, my volunteer manager friends and I decided at the last minute to take in the screening. We found the theater, well, actually it wasn’t a theater, it was in the basement of an apartment building but hey, they had popcorn, so we went in and took our seats on the folding chairs. We had decided to dress up as volunteer managers for the movie and a couple of us wore magician’s hats and another carried a magic wand. I opted to wear my pack mule costume which was a mistake. I kept falling off the chair because the “junk” strapped to the back of my itchy mule costume made me top heavy. 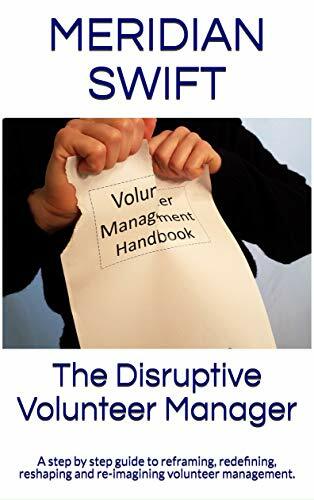 Good volunteers quit in frustration. Staff seeks answers from the newly hired volunteer coordinator, Darrius, who can’t believe things are that bad. He calls Rebin into his office for a chat. An inexperienced Darrius offers her a cup of coffee and flippantly says. “I hear you’ve been mistreating other volunteers.” He chuckles at the absurd notion. Enraged, Rebin shouts as she slams her cup down, “well if you did your job, then I wouldn’t have to step in!” A spray of coffee spittle hits Darrius, who takes out his handkerchief and wipes his face. Rebin continues, her eyes wild with anger. “I’m the only one here who does things right.” Just then, the room grows icy cold when the ancient building’s heater unit stopped working again. Puffs of icy breath billow in front of Rebin. The ringing of the desk phone shatters the silence but Darrius ignores it, because he knows who it is (It’s the executive secretary who always calls him when something in the building breaks). Rebin growls at him and walks out. The next day, Rebin comes up behind a volunteer, Buck and snatches papers from his hand. “You filed the 525 project under P,” she screams, “it goes under 5 you moron!” Shaken staff run from the room. Buck storms out and heads for Darrius’ office. Overwhelmed and unsure how to handle the situation, Darrius calls the former volunteer coordinator, Lannie, a crusty older woman who agrees to drive her 20-year-old camper where she’s been living since retiring on a non-profit pension back to town to help. She arrives with a satchel full of worn books on management the following day. Clutching the book her former boss gave her, “Workers Are Wrong, But You Can Make Them Obey,” Lannie suggests a strategy involving using the sandwich method of reprimanding (you know, the one where you praise the volunteer first, then point out that he/she has done something wrong, well, wait, now that you are here with those volunteer eyes looking at you, not really wrong, but maybe just misunderstood, or well, honestly what they did wasn’t so bad, no…wait it was actually justified, or needed and they were actually right all along and what were you thinking criticizing this perfect volunteer and then you wrap up with how great they are and how you are not worthy to have them, so nothing is ever resolved) They call Rebin in. 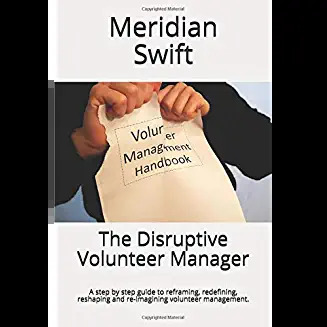 The Executive Director sticks her head in the door, asking “what is all this noise about,” and Rebin’s head whips around so quickly, it looks like it swiveled on her neck. In an other worldly voice, she hollers, ” It’s not fair! It’s Darrius’ fault! He told me I had leadership potential!” The Executive Director shuts the door and scurries away. All heck breaks loose. Rebin looks for Darrius’ weak spot. “You’re new. You don’t know anything at all, do you,” and for a moment Darrius freezes, feeling completely inadequate until Lannie snaps him out of it by whacking him with his ‘zen office worker’ mug. Darrius resumes reciting the policies and procedures manual while Rebin laughs maniacally. Together, Lannie and Darrius repeat over and over, “we have rules, we have rules.” Rebin suddenly growls, “fine, I quit,” and gets up so fast that Lannie falls off her chair. At that moment, Darrius realizes that he needs to step up because he is the best person to make this situation better. He knows what he needs to do. Rebin relaxes, and Darrius can feel all the anger leave her. She nods, and Darrius promises to call her the next day. Rebin hugs him as she leaves. We are all going to encounter difficult volunteer behavior, but it doesn’t have to be scary.